« What’s the best way to Santa Cruz? Ride to Santa Cruz from Los Gatos, and return. It’s about 5,200 feet altitude gain. After gathering everyone’s input, I decided to share a map of the best route from Los Gatos to Santa Cruz and back. It builds on the ride I profiled in Bay Area Bike Rides, editions two and three. The ride has much to see as it literally covers historic ground that is the stuff of legends. You’ll ride by Mountain Charlie McKiernan’s house where, nearby, he battled a grizzly bear. You’ll look down on the waters of Lexington Reservoir where there were two communities (Lexington, Alma) and tracks of the South Pacific Coast Railroad, swallowed up in 1952 with the dam. There’s Holy City where a cultist tried to build a utopian society. Today it’s one shop (closed) on Old Santa Cruz Hwy at the entrance to Redwood Estates. 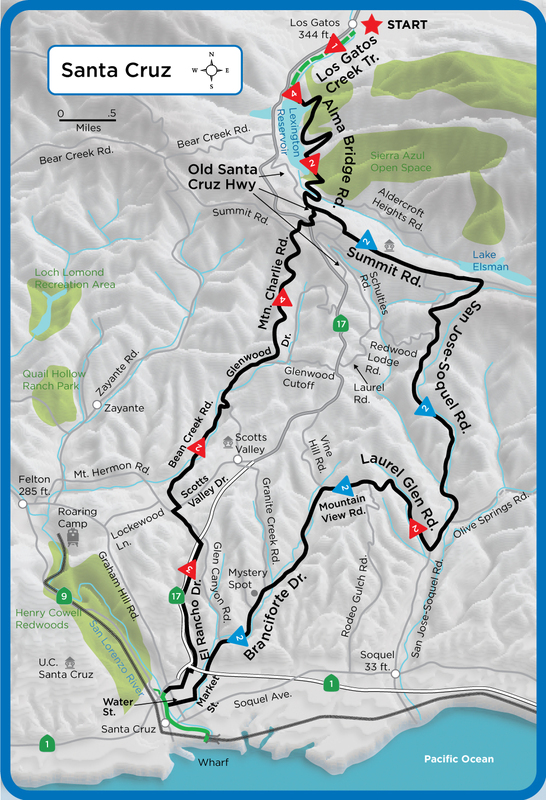 You’ll speed down San Jose-Soquel Road, one of the best descents in the Santa Cruz Mountains, and then turn right onto the less traveled Laurel Glen Road. Casalegno Store has been at this location since the 1920s. On Branciforte Drive, watch your electronic devices go haywire as you pass the Mystery Spot. It’s a must visit to appreciate the lure of gullibility and sight tricks. Avoid all the traffic by taking the scenic San Lorenzo River path, but watch out for needles. Of course, once you’re at the Santa Cruz Boardwalk, nothing beats a ride along West Cliff Drive to soak in the festive beach atmosphere, along with watching surfer dudes and dudettes ride the waves. The return ride will test your legs on Mountain Charlie Road, but I much prefer the climb over the descent. On the ride up you’re alone with your thoughts on a quiet road. Seeing the bright blue grain silo (converted into a house) makes the climb worth the effort. Once you’re done, you’ll join me in launching a GoFundMe campaign to bring back the South Pacific Coast Railroad right of way as a world class bike path. We’ll only need 800 million dollars or so to tear out Lexington Reservoir, open the tunnels, rebuild some creek bridges, and buy some of San Jose Water Company’s land. Enjoy your ride. Mileage Log > Start at E. Main Street and ride south on Los Gatos Creek Trail, next to Hwy 17, keeping Los Gatos Creek on your left. 1.3 Steep section. 1.77 Alma Bridge Rd. 5.95 Keep right on Aldercroft Heights Rd. 6.46 Left onto Old Santa Cruz Hwy at stop sign. 9.11 Mountain Charlie Rd. 10.14 Left onto Summit Rd. at stop sign. 11.5 Morrill Cutoff. Cuts over to San Jose-Soquel Rd. No traffic but steep and bumpy. 12.65 Summit store. 12.84 Right onto San Jose-Soquel Rd. 14.8 Redwood Lodge Rd. 20.77 Right onto Laurel Glen Rd. at Casalegno store. 23.0 Becomes Mountain View Rd. 23.9 Left onto Branciforte Dr. at stop sign. 26.9 Granite Creek Rd. 27.36 Mystery spot. 28.6 Glen Canyon Rd. 29.22 Becomes Market St. 30.05 Right onto Water St. at traffic light. 30.43 Right onto path to circle under bridge over San Lorenzo River. Take path south. 31.8 Santa Cruz Beach Boardwalk on right past parking lot. Return on river path: 33.53 Right, crossing bridge, then jog left to begin Felker St. 33.78 Right onto Ocean St. at stop sign. Cross Ocean St. to begin Plymouth St., keeping left after crossing. 33.9 Keep right on Plymouth at on-ramp to Hwy 17. 34.13 Becomes Fernside St. 34.27 Left onto Emeline Ave. at stop sign, crossing under Hwy 1. 34.49 Keep left on Emeline at junction. 34.58 Left at parking driveway to Plymouth St. 34.64 Right onto Plymouth St. at stop sign. 35.1 Becomes El Rancho Dr. 35.75 Keep right at junction for La Madrona Dr. 37.72 Left onto Hwy 17 flyover at stop sign. Becomes Mt. Hermon Rd. 38.44 Right onto Scotts Valley Dr. at traffic light. 38.54 Left onto Bean Creek Rd. at traffic light. 42.19 Left onto Glenwood Dr. at stop sign. 43.15 Left onto Mountain Charlie Rd. 44.9 Steep section. 45.45 Steep section. 48.22 Right/straight onto Summit Rd. at stop sign, crossing Hwy 17. 48.41 Left at stop sign onto Summit Road, followed by immediate left onto Mountain Charlie Rd. 49.91 Left onto Old Santa Cruz Hwy at stop sign. 51.83 Right onto Aldercroft Heights Rd. Alternate route is stay on Old Santa Cruz Hwy, Hwy 17 on ramp, exit onto Alma Bridge Road in half mile. 52.34 Left onto Alma Bridge Rd. 56.52 Right onto Los Gatos Creek Tr. at Lexington Reservoir dam. 58.28 End ride on E. Main St. This entry was posted on January 21, 2019 at 3:26 pm and is filed under Ride reports. You can follow any responses to this entry through the RSS 2.0 feed. You can leave a response, or trackback from your own site. I agree, it’s a nice loop. Any recommended coffee shops to stop at in Santa Cruz? When you have time: Best routes to Pescadero and back? We are so lucky to have all of these great little lightly traveled roads scattered throughout the Santa Cruz mountains. Not sure about coffee in SCZ, but Summit Store on Summit Road has an outstanding fresh coffee selection at a reasonable price. Pescadero has only one access, Pescadero Creek Road. Hwy 84/Stage Road is the best loop.